Non-adherence to medication contributes to up to 8% of hospital admissions and readmissions. Our smart solution helps users to take the right medication at the right time and thereby promote self-care. Sealed, labelled and dispensed by our network of community pharmacies, each tray has individually labelled, removable pods that help users to take their medications as prescribed. In 2015, the estimated cost of medication waste to the NHS was £300 million1. Biodose Connect helps reduce these costs by preventing non-compliance of users that are Unintentional Non Adherent to their prescribed medication, which contributes to this issue and escalating Local Authority care costs. If users aren’t taking medication as prescribed, the online dashboard can offer timely interventions to support positive outcomes. If medication is not removed from the tray after a configured time, relatives or Telecare centres receive a further customised message. Interventions will be provided according to the need and may include calling the user or the clinician. Available in user-friendly formats, compliance data is presented in an online dashboard as well as reports to enable clinicians to monitor and track users adherence to medication. Data highlights when doses are not removed, incorrectly removed, taken late or too early. 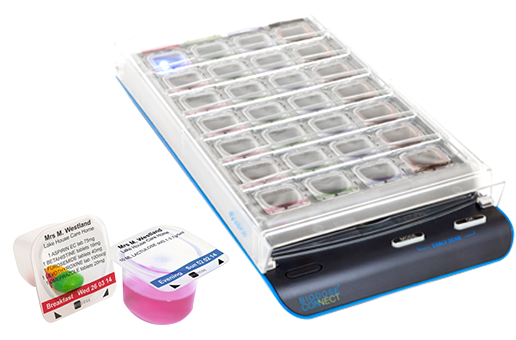 While the device stays with the user, empty trays can be re-ordered via your chosen pharmacy.